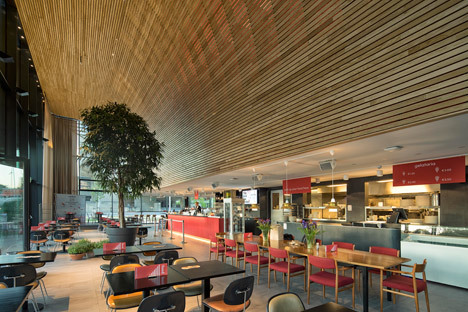 Powerhouse Company has completed a new student centre for Erasmus University in Rotterdam, which characteristics a transparent exterior and a curving oak interior (+ movie). 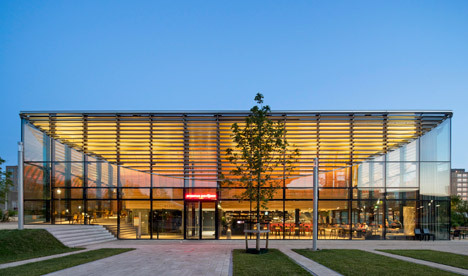 Described by the Dutch studio as getting an “egg-in-a-box arrangement”, the 1,800-square-metre student pavilion is intended to turn out to be the new social heart of the university campus, positioned to the east of the city centre. 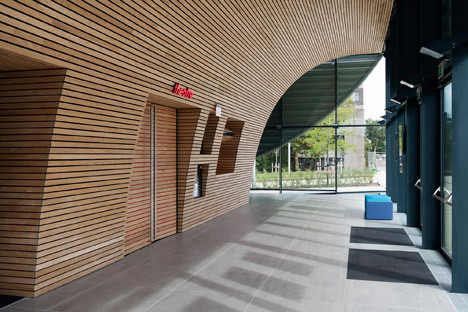 One of the major aims of the project was to generate a vibrant and welcoming space for staff and students, so Powerhouse Business designed the creating to be as open as possible – with the most public activities concentrated about the perimeter. This idea resulted in a building with two layers. 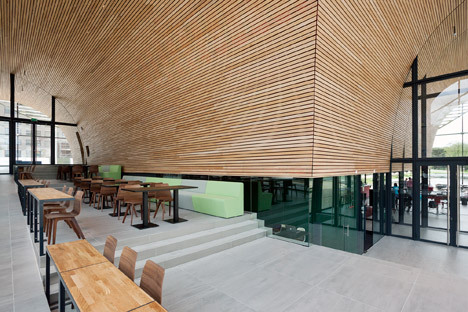 Cafe and study areas sit directly behind the transparent facade, while storage areas and service spaces are positioned behind a curving wall of timber, which also encloses a 200-seat events space. 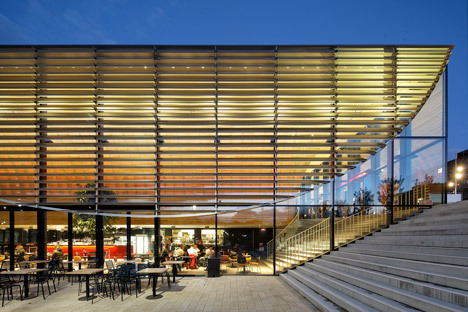 The foyer is positioned on the south facade, exactly where it fronts a public plaza. 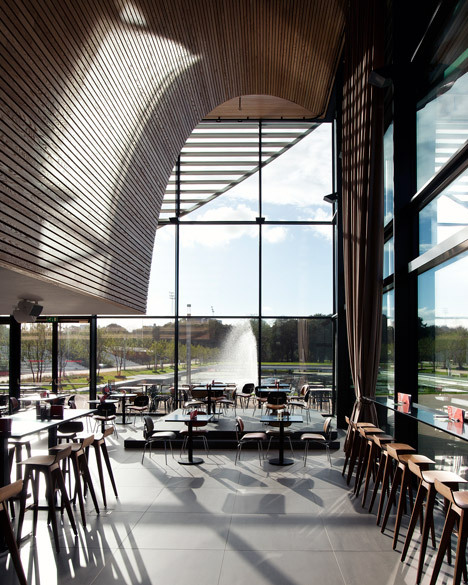 A study region sits beside the north-east wall to limit glare on computer screens, although the cafe runs along the western edge to advantage from evening sun. 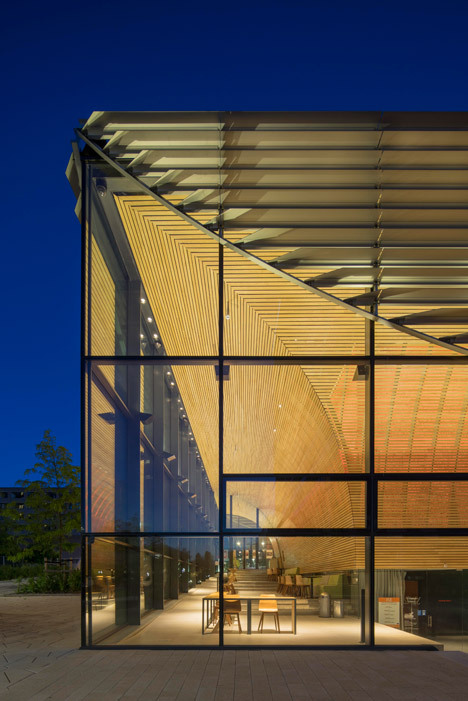 “This ‘egg in a box’ arrangement preserves the transparency of the exterior via its floor-to-ceiling glazing,” mentioned the architects, who won a competition to style the creating in 2010. The creating is just two storeys higher, which the architects hope will provide “a welcome break amongst the tall Brutalist buildings of the university’s suburban campus”. 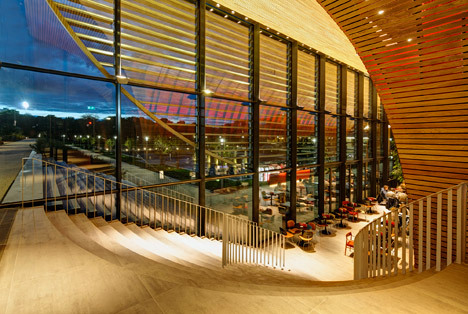 The stepped landscape of the site allowed each levels to meet the ground, and the curving measures of an adjacent pathway continue inside the constructing, forming the main internal staircase. 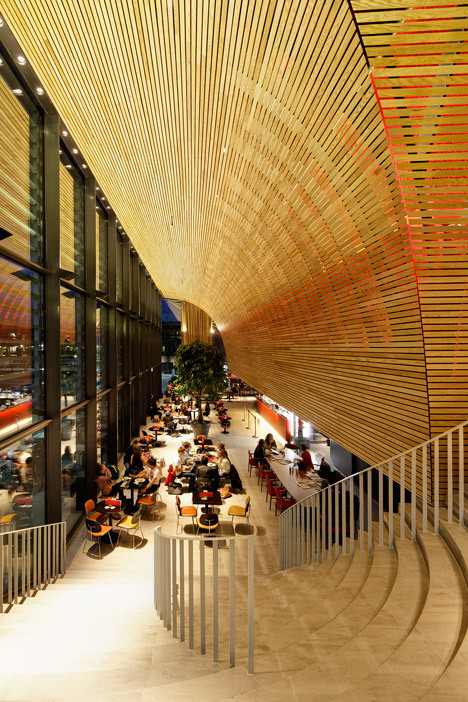 The curving red-oak wall creates a semi-barrel-vaulted ceiling above the numerous social spaces. The kitchen, toilets and technical spaces are hidden away behind it, organised around a central corridor. 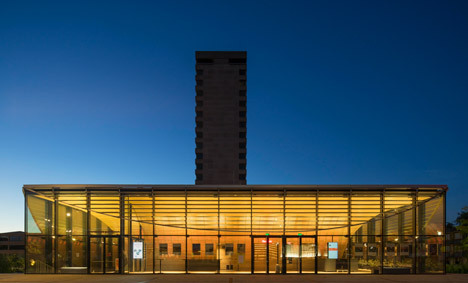 “This lath structure makes an eye-catching feature and softens the materiality of the internal spaces,” added Powerhouse Company, whose current projects contain a triangular railway station and a one hundred-metre-tall broadcast and observation tower. Mechanical louvres type a huge semi-circle on the four facades and can be adjusted to act as a sunscreen, relative to the sun’s position in the sky. 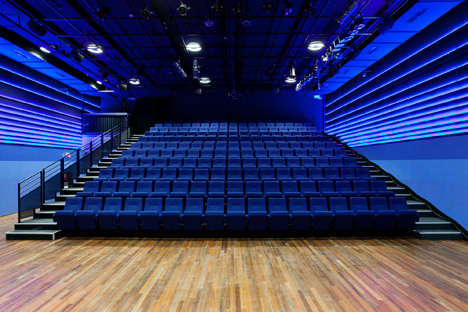 Large hatches in the roof open automatically to allow air to circulate, although a ground-sourced heat pump keeps the constructing warm in winter. 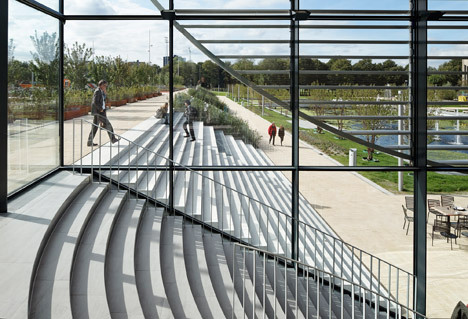 The Erasmus University student pavilion forms element of a wider masterplan for the campus by Danish landscape firm Juurlink + Geluk and Studio Sputnik. Other new additions will incorporate a canteen, and underground vehicle park and new landscaping.